Acid Blondie Maduro is a flavor powerhouse; it features the same aromatic infusion as the original Blondie, but with a chocolatey Maduro wrapper that adds some rich sweetness to the mix. 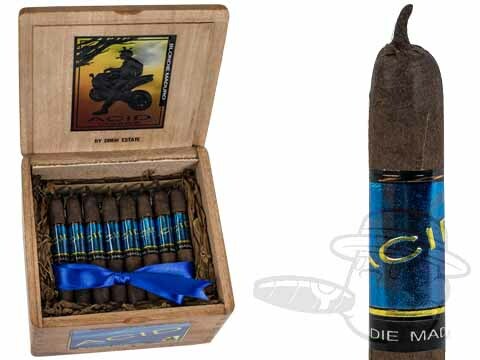 Acid Blondie Maduro is a mellow-to-medium bodied cigar in a compact 4x38 Petite Corona vitola, boasting notes of herbs, cream, cocoa, and honey with citrus undertones. Love these sweet little sticks! I'm not a fan of most flavored or soaked cigars, but I do like a more medium blend, about the harshest I am willing to smoke are Macanudo's. This cigar could be a daily smoker for me easily. The smoke is mellow, the taste is sweet. Great cigar I intend to introduce to my friends. I will not, however, show them the box they come in. ACID has the dumbest logo I have ever seen. Some kid with pigtails and a cigar leaning against a crotch rocket. Full retard. This is a great little cigar with lots of bold flavors. Nice smoke when you don't have time for a full size cigar. This little beauty is just about perfect! Slightly sweet but not overwhelming, mild never harsh. I love most products by Drew Estates/Acid, but this is one of my favorites. These little babies are wonderful. Flavorful and smooth. They aren't an 'hour cigar' if that's what you want but they'll give you 30 minutes of flavor that's good to the last lip blistering drag. always smooth and rich with no bitterness. Tried these after trying a Blondie. Both are keepers. Very tastey. Take a great break with a Blondie. They are Acid Blues, sweet & smooth. I get them for my wife. I love this flavor and it's even better in a Maduro wrapper! My favorite thing to do in life is to play my Gibson L6S guitars. Against the wall behind them is a stack of empty Acid Blondie cigar boxes. Perfect small cigar for a smoke when you may not have much time. Arrived moist, very good flavor and great burn. Perfect to share with friends and introduce them to cigars! The Blondie Maduro is a very nice smoke. Great aroma & taste. From my first discovery of this cigar variety a couple of years ago, it's one of my "go to" smokes. A hint of sweetness with a clean smoke and no bite, it's simply a great small variety. Probably my favorite of all in the Acid and LarutaN. Reasonably quick smoke because of its small size, but it just tastes good. The nib on the end comes right off so there's no need for a punch or cutter. For such a small cigar it has a big cigar finish. Acid Blondie Maduro is rated 4.6 out of 5 based on 34 customer ratings.